Street Name Address Plaque 2 Lines Traditional Oval - - simulated carved wood accents add sophisticated elegance to the decorative border. Personalized with the address number and street name you supply. Made in USA. Line 2 holds up to fifteen (15) 1.25" characters for the street name and curves to follow the shape of the oval. PS pewter surface with silver characters (large image). Small images (from left to right): AC antique copper; BG black surface with gold characters; BS black surface with silver characters; BV bronze verde; OB oil rubbed bronze; OG bronze surface with gold characters; and PS pewter surface with silver characters. 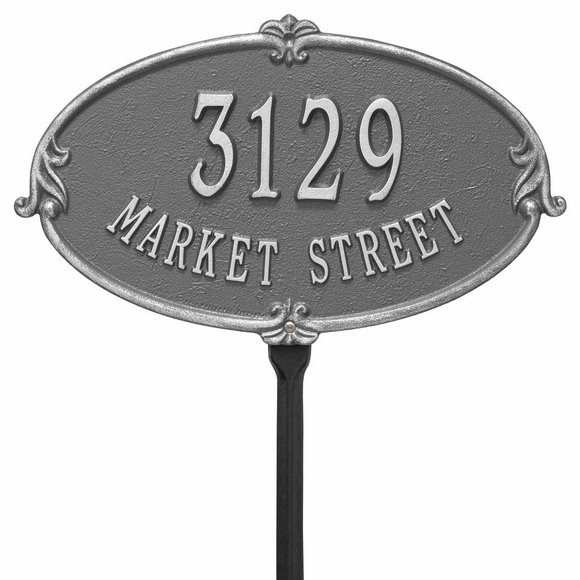 To purchase a one-line version of this sign with the street number only, click top link in Related Products. It was shipped sooner than expected--wow! We are so pleased wit the quality of the item. We would shop here again.